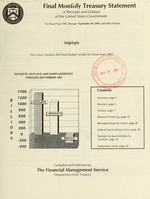 This issue contains the final budget results for fiscal yea .1991.
issued by the Architect of the Capitol to finance the Federal Judiciary Office Building. the Office of Management and Budget and released on July 15, 1991. Oct. Dec. Feb. Apr. June Aug. Oct. Dec. Feb. Apr. June Aug. Sept.
Feb. Apr. June Aug. Oct. Dec. Feb. Apr. June Aug. Sept.
%-, .,,...,.. ..... ... ..%% ..% %.,.. .... . ......... .
Dec. Feb. Apr. June Aug.Sept. Other ...... ................. ................... ..
'Includes amounts for windfall profits tax pursuant to P.L 96-223. Guaranteed student loans ....................... ..
Quinquennial transfers to the general fund from FHI..
Office of Surface Mining Reclamation and Enforcement. 50 ...... 50 660 ...... 660 .. ... .
...... ...... ...... 511 ...... 511 490 .. .. Rents and Royalties on the Outer Continental Shelf lands. ludes receipts totalling $2,763 million. : Details may not add to totals due to rounding. are reflected as received and withdrawals are reflected as processed. (" ) Less than $500,000. Grants to States for Medicaid .. This month to D .
Note: Changes noted in the above tables are also reflected in Table 7, pages 26 & 27; and in Table 8, page 28.
will be 2:00 pm EST November 22, 1991.